James Buchanan Jordan was a prosperous farmer and livestock raiser. He was the youngest son of Captain John and Eliza Jane Jordan. He was born November 27, 1856 in his parents' home in San Juan Bautista, Monterey County, California. He was nearly one year old when his parents moved to Tulare County in 1857. The J.W.C. Pogue home now is on the south half of the original 80 acres which John Jordan purchased in 1856. James spent all his youth with his mother Eliza Jane. He was six years of age when his father Captain John Jordan was drowned in the Kern River in 1862. After he was old enough (ten), his mother gave him the job of herding and looking after their band of 200 sheep up in the foothills, east of now Lemon Cove. This became know as the Jordan Flat Country. The sheep were taken to the hills in late spring and brought back in the late fall of the year. In the winter months, Jim went to school and did odd jobs around the farm. The job he hated most was picking down from the geese. An old goose could pinch very hard if he got his head loose. There was wool to cord and cotton fiber to be picked from the seed and cows to be milked for family use. He had a saddle horse which he rode and learned to rope from. He rode this horse around the countryside every chance he could. He did this when the chores were done and when he was not in school. One day while riding along the Kaweah River, which was swampy with thickets and much large timber growth, he came upon a cowhide just about all covered with dirt. Just a bit of it was sticking out of the ground. There was some cattle rustling going on around the country. Evidently the rustlers had killed an animal, dressed it out and then buried the hide to cover up the evidence. Jim got off his horse and tried to pull the hide out of the dirt by hand. He could not do so. He then tied his rope to the saddle horn. He gave the horse the spurs and with a hard lunge forward his horse took off breaking the saddle gear. The horse went on and Jim with saddle and all hit the ground very hard. He broke his right leg at the knee. He wanted to pull the hide out of the ground so that he could identify whose cow it was, if he could. Jim was around sixteen when this took place. He suffered very much while in the healing process. This accident left him with a slight limp which stayed with him the balance of his life. One summer day while looking after the sheep up in the hills, he saw a fierce mean-looking Indian buck off at a distance eyeing things. Jim grabbed his gun in readiness and watched the Indian, who didn't come any closer and who soon went down a ravine and out of sight. This shook young Jim a bit, and he was alert the balance of the day and for several days. This Indian was a renegade from the reservation. He was called or named Hawkeye and he was mean, but he kept to himself. All these long days and years alone with his sheep, Jim read the Bible several times. He had a good knowledge of the Bible and could quote any passage of it in any argument that came up for the balance of his life. He was very faithful to his mother, helping her in any way that he could. His schooling was short, as he only went as far as the 6th grade in the elementary school but this did not hold him back from his life's aim. When Jim became 21 years of age, he told his mother that he was going to step out in the world on his own, and he did. He spent the next five years in the ore mines in Nevada, Arizona and New Mexico. He learned much of the earth's minerals and came home very knowledgeable. He could state what was in a piece of ore. While in the mines, he contracted lead poisoning which took him a long time to overcome. The only way to counteract the lead poisoning was to eat many limes for several years, whenever he could get them. In that day and age, there were not many limes around to eat. This lead poisoning could have shortened his life somewhat as he died a young man of 67 years. Jim Jordan came home from the mines in the year of 1882 to Tulare County. The next year, he went to Kern County near his brother Fred's homestead. This was near what is now the town of Delano. He took up a homestead for himself. Posy Creek ran through his homestead. He built a small house and barn there. He settled down to farming grain and potatoes. He worked with his team of four horses for Car & Hagen Land Company. Whenever he could, he would buck up the levies. He and his neighbors, including his brother Fred, went up Posey Creek where they put a dam and dug a ten mile ditch back to their farm. They irrigated small plots of their land. The water gave out early in the summer, but they got in one good irrigation per year which helped them very much indeed. In 1888, Jim improved upon his homestead. He got his patent and deed to his land. He then rented his farm out and moved back to Tulare County, where he went into a partnership with his brother E. F. (Forney) Jordan. They were in the dry grain farming business. At this time, he had accumulated a good six horse team and farming tools. Jim and Forney farmed grain for a good many years - around 5,000 acres each year. They were the first farmers to introduce the combined harvester, pulled by 28 head of horses, which was quite a scene in those days. The dry grain farming was feast or famine as some years they had a bumper crop and other years they just got their seed back. In all, they made a little money and never got rich, although they accumulated more land. They also raised turkeys for the market. Every fall they had a turkey picking bee. They would dress these turkeys and ship them to San Francisco by rail to market. In the year of 1893, James B. Jordan married Ellener Ann Myers in Bakersfield, California. 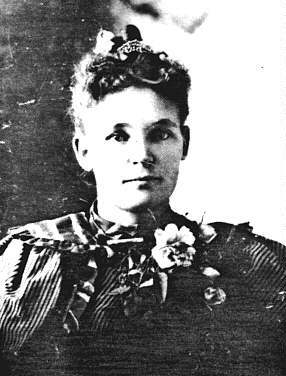 She was born March 10, 1874 in San Diego County. To this union were born 12 children, whom are in order: Claud Allen, born 1894; Grace May, born 1895; James Earl, born 1897; Harvey Hampton, born 1900; Preston Scot and Ethel Fern (twins), born 1903; William Francis, born 1905; Robert E., born 1906; Frederick Omega, born 1908; Leonard L. and Lora L. (twins), born 1910; and Gertrude Matilda, born 1912. These children were all healthy. Robert E. died with lockjaw from a wound in his foot in 1917, Harvey Hampton was killed in World War I in 1918. The remaining children have all grown to become good citizens. Jim and Forney farmed together until 1899. Their relationship was very harmonious all those years. This the western view of the James Buchanan and Ellener Ann Jordan home and ranch house in the Yokohl Valley which was built in 1906. In this house the last five children were born out of a large family of twelve. 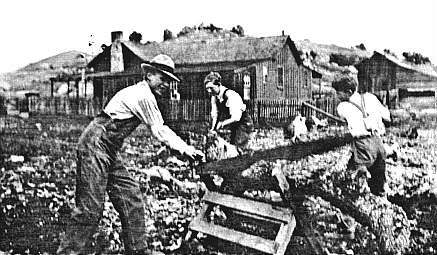 The people in this picture are William Francis (Bill) Jordan, Milton Morter using the saw, and Lloyd Morter in the center splitting the wood. The latter are his cousins visiting from Canada. This was winter time and wood had to be cut for the fireplace. Picture taken January 20, 1918. In the late 1890's there was much talk about forming an independent Order of Odd Fellows (I.O.O.F.) lodge in the city of Exeter--a young, striving town. In late 1897, a petition was sent to the Independent Order of Odd Fellows of California in San Francisco, California, which is the Grand Lodge of California. There were several names on this petition of local people and one of them was James Buchanan Jordan. In early 1898, the Independent Order of Odd Fellows, Exeter Lodge number 308 was duly instituted. Brothers from the Grand Lodge of California and brothers of Four Creeks Lodge #94 of Visalia came and did the instituting. Officers of Exeter Lodge 308 had their first election of officers. J. B. Jordan and E. F. Jordan were both selected as Trustees of the Lodge. The members who were elected at this time were called Charter Member Officers. Jim and Forney attended Lodge faithfully from then on. In the year 1899, James B. Jordan bought up the mortgage of his brother W. F. (Bill) Jordan's ranch in Yokohl Valley. Out of the deal he left brother Bill his home and 480 acres of land free and clear. In that same year, 1899, Jim Jordan moved his family up into the Yokohl Valley on Bill Jordan's ranch and there started farming grain that fall. The next two years he farmed grain and bought a new combine harvester. He also went to raising hogs and on the bottom land along the Yokohl Creek he grew pie melons and pumpkins for his hogs and also fed them grain. He soon stopped grain farming and went to raising hogs in a large way. He grew enough grain to feed his hogs. He sold his combine harvester in the shuffle. He soon paid off the mortgage with the sale of hogs and then to make things easier for himself, he finally went out of the hog raising business and went into the cattle business, which he kept until his death. He prospered and enlarged his holdings by buying out two cattle ranches, which gave him more than 5,000 acres of good grazing land. His large family of boys and girls helped him to prosper as they were all good helpers. Jim and Ellener schooled their children in the Yokohl Valley Elementary School, and in the later years they had to finish elementary schooling by sending them to the Lincoln Elementary School in Exeter. They also sent them to the Exeter Union High School. They drove the family's Model T car to school. James Buchanan Jordan passed away on March 19, 1924, leaving his ranch to his widow Ellener Ann Jordan. She ran the ranch and sent her younger children to school. She settled the estate in one year and then formed a corporation, giving every living child of hers and herself, equal shares. She ran the ranch until 1930. At that time, it was sold and divided equally between the shareholders. Ellener Ann Jordan passed away on May 30, 1947. James and Ellener Jordan bought a family plot in the Exeter Cemetery in the fall of 1917 at the death of their first child, Robert E. Jordan, who at the age of nine was buried in this plot. Their son Harvey Hampton Jordan, who lost his life in France on the battle front of World War I in September of 1918, was also buried in this plot. James Buchanan was buried in this plot on March 22. Also, his wife Ellener Ann Myers Jordan who died on May 30, 1947, was layed to rest in this plot. She was buried on June 4, 1947.